There is substantial variability across studies of default mode network (DMN) connectivity in major depressive disorder, and reliability and time-invariance are not reported. This study evaluates whether DMN dysconnectivity in remitted depression (rMDD) is reliable over time and symptom-independent, and explores convergent relationships with cognitive features of depression. A longitudinal study was conducted with 82 young adults free of psychotropic medications (47 rMDD, 35 healthy controls) who completed clinical structured interviews, neuropsychological assessments, and 2 resting-state fMRI scans across 2 study sites. Functional connectivity analyses from bilateral posterior cingulate and anterior hippocampal formation seeds in DMN were conducted at both time points within a repeated-measures analysis of variance to compare groups and evaluate reliability of group-level connectivity findings. 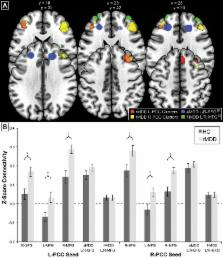 Eleven hyper- (from posterior cingulate) and 6 hypo- (from hippocampal formation) connectivity clusters in rMDD were obtained with moderate to adequate reliability in all but one cluster (ICC's range = 0.50 to 0.76 for 16 of 17). The significant clusters were reduced with a principle component analysis (5 components obtained) to explore these connectivity components, and were then correlated with cognitive features (rumination, cognitive control, learning and memory, and explicit emotion identification). At the exploratory level, for convergent validity, components consisting of posterior cingulate with cognitive control network hyperconnectivity in rMDD were related to cognitive control (inverse) and rumination (positive). Components consisting of anterior hippocampal formation with social emotional network and DMN hypoconnectivity were related to memory (inverse) and happy emotion identification (positive). Thus, time-invariant DMN connectivity differences exist early in the lifespan course of depression and are reliable. The nuanced results suggest a ventral within-network hypoconnectivity associated with poor memory and a dorsal cross-network hyperconnectivity linked to poorer cognitive control and elevated rumination. Study of early course remitted depression with attention to reliability and symptom independence could lead to more readily translatable clinical assessment tools for biomarkers. A default mode of brain function. A baseline or control state is fundamental to the understanding of most complex systems. Defining a baseline state in the human brain, arguably our most complex system, poses a particular challenge. Many suspect that left unconstrained, its activity will vary unpredictably. Despite this prediction we identify a baseline state of the normal adult human brain in terms of the brain oxygen extraction fraction or OEF. The OEF is defined as the ratio of oxygen used by the brain to oxygen delivered by flowing blood and is remarkably uniform in the awake but resting state (e.g., lying quietly with eyes closed). Local deviations in the OEF represent the physiological basis of signals of changes in neuronal activity obtained with functional MRI during a wide variety of human behaviors. We used quantitative metabolic and circulatory measurements from positron-emission tomography to obtain the OEF regionally throughout the brain. Areas of activation were conspicuous by their absence. All significant deviations from the mean hemisphere OEF were increases, signifying deactivations, and resided almost exclusively in the visual system. Defining the baseline state of an area in this manner attaches meaning to a group of areas that consistently exhibit decreases from this baseline, during a wide variety of goal-directed behaviors monitored with positron-emission tomography and functional MRI. These decreases suggest the existence of an organized, baseline default mode of brain function that is suspended during specific goal-directed behaviors. The brain's default network: anatomy, function, and relevance to disease. Thirty years of brain imaging research has converged to define the brain's default network-a novel and only recently appreciated brain system that participates in internal modes of cognition. Here we synthesize past observations to provide strong evidence that the default network is a specific, anatomically defined brain system preferentially active when individuals are not focused on the external environment. Analysis of connectional anatomy in the monkey supports the presence of an interconnected brain system. Providing insight into function, the default network is active when individuals are engaged in internally focused tasks including autobiographical memory retrieval, envisioning the future, and conceiving the perspectives of others. Probing the functional anatomy of the network in detail reveals that it is best understood as multiple interacting subsystems. The medial temporal lobe subsystem provides information from prior experiences in the form of memories and associations that are the building blocks of mental simulation. The medial prefrontal subsystem facilitates the flexible use of this information during the construction of self-relevant mental simulations. These two subsystems converge on important nodes of integration including the posterior cingulate cortex. The implications of these functional and anatomical observations are discussed in relation to possible adaptive roles of the default network for using past experiences to plan for the future, navigate social interactions, and maximize the utility of moments when we are not otherwise engaged by the external world. We conclude by discussing the relevance of the default network for understanding mental disorders including autism, schizophrenia, and Alzheimer's disease. Copyright statement: Copyright © 2018 Bessette, Jenkins, Skerrett, Gowins, DelDonno, Zubieta, McInnis, Jacobs, Ajilore and Langenecker. Default mode network connectivity indicates episodic memory capacity in mesial temporal lobe epilepsy. Dysregulation of working memory and default-mode networks in schizophrenia using independent component analysis, an fBIRN and MCIC study.